Attending the NFV World Congress last week gave me a chance to talk to many carriers about their migration into a virtualized network. Many have made big progress. In fact, Verizon has already begun to deploy an OpenStack environment. Carriers continue to aggressively push into NFV with NTT announcing they will virtualize 75% of their network by 2020. AT&T and now NTT Docomo and many others have either declared their virtualization goals or have begun to take active steps toward achieving them. Given these aggressive plans, carriers are looking for early wins in virtualization and many have found it in virtual Customer Premise Equipment (vCPE). CPE is the gear that carriers install in the enterprise to deliver connectivity service and acts as the traditional demarcation point between the carrier network and the enterprise network. However, CPE also has two additional characteristics that make it a prime candidate for virtualization: 1) It is a significant expense for carriers. Large CAPEX and OPEX is spent annually on the hardware needed for every enterprise branch location as well as the truck rolls required to install the hardware. 2) It is largely a self-contained function without the need to integrate into the legacy OSS/BSS systems for the carriers. This leaves vCPE as the logical choice to save CAPEX and OPEX as a completely SW-based solution in a simple, standalone device that can be easily deployed. Multiple carriers discussed their plans to rollout vCPE as the first NFV use case, leveraging virtual functions like routing, firewall, DDOS security, IP VPN and others. This is great news that carriers are moving forward into this great virtualization challenge and have identified their first easy win. 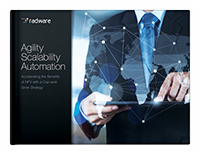 Radware recently made some significant technology strides toward virtualization, proving its Alteon NG VA ADCs can deliver 200Gbps in NFV or 20Gbps in Openstack.